It is really beautiful, big round face but it sits flat against the wrist. Just enough bling with the stones round the face. Rose gold is stunning. Purchased for my daughters birthday and she is delighted with it. A birthday present for my daughter, fantastic price, great service delivered when expected but a massive smile and hug from my daughter priceless. I bought this item as a Christmas gift for my girlfriend who was delighted with the item. The product came equistlety packaged and boxed and was in great condition upon arrival. Ordered the item on a Sunday evening at 10pm the product arrived at 9am track on the Tuesday. Once the item was unpackaged by my partner we went to goldsmiths jewellers and were able to get the watch adjusted to exactly the correct all in all I would definitely use watchshop again and reccomend to anyone wishing to purchase a watch. This Darci watch is one of the best watches I have ever purchased!! From it’s elegant and feminine appearance to the tiny details within the watch. The individual crystals give it a glam look without it being too much. The face of the clock has a slight weight to it but not to the point where it is uncomfortable or annoying. It sits perfectly on my wrist as watch shop fixed the strap to the size of my wrist which is quite small. The rose gold colour goes with anything, giving my outfits a special touch. It attaches with a clasp which is fast and easy if in a rush which I think is an added feature to the design. It came package in a white box lined with brown suede fabric contrasting the two colours nicely. From the purchase to it being delivered at my door step everything has been fantastic from the extremely high quality watch to the service, I received regular emails to say where my watch was and the expected delivery time. Safe to say I will wearing this watch everyday to give my outfits some glam. Nice watch, bought it for my Mrs no Christmas ! My girlfriend passed her training and I thought what better way to show how proud I am of her with a beautiful watch, the gift wrapping was great for the price! Would genuinely use watchshop again! Unbelievable value and service. This is the 5th watch I purchase for them . This watch was bought as an 18th birthday gift and the recipient was delighted with it. As stated in other reviews I had no problems with the ordering process or speed of delivery. Would recommend to others. It came just as how it was described. The delivery timing was perfect! The watch overall is perfect. Lovely watch. Bought it for my other halves birthday and she loved it too. \r\nGreat price and arrived pretty quickly! Excellent company to deal with, incredible value for money and fast delivery. Love love this watch !! Its glamorous or casual and not ott . 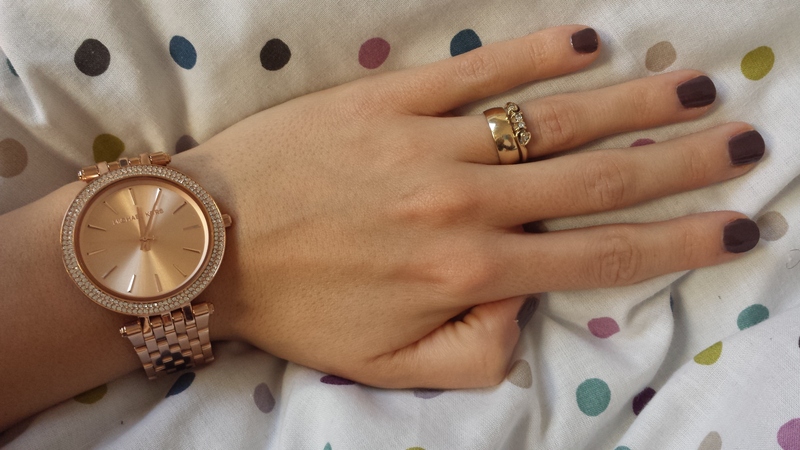 The rose gold is lovely and soft .. highly recommend this beautiful watch ! Excellet service and beautiful watch. The item was as I expected. very nice, very sleek, nice weight, love the face, very cute. Bought this for my girlfriend, she loves it. Great website and easy to use. Got it gift wrapped which was well worth it and was delivered next day. My daughter bought this for my 50th birthday. When I opened it i was totally amazed how beautiful it was and cant wait to wear it. It fits a treat and looks amazing on my wrist. A lovely size bracelet and such a pretty shiny face looks a lot more expensive than it really was. A perfect present for any girl or woman and is presented in a lovely box a must buy. Amazing watch for a great price, used a discount code and saved over £100 compared to high street retailers. My other half loves it, the rose gold is perfect and the diamonds around the edge are not too much. Even made my purchase and took it to goldsmiths to have the links removed free of charge. Thanks watch shop! The watch is lovely! Love the Rose gold colour! It looks great on my hand! I like everything about it, colour, decorations, size, smart Look. Was not a problem at all . Overall this micheal kors watch is one of the best buys ,looks excellent with any outfit casual or formal . I am looking to buy one more for my mum soon to gift her for birthday. Totally happy with this product. I got it as a gift for my mum and she loves the watch. Stunning watch that is beautiful to look at and to wear. Comfortable strap with very easy open and close. The rose gold is a lovely colour, and the style really doesnt disappoint. Definitely a statement item. Beautiful watch delivered with in 24hrs. The watch is very beautiful I like everthing about the watch, design, colour, strap everything wonderful. The watch is a good quality popular make. At first sight of the watch I already chosen it. Hope to buy more in the months ahead. 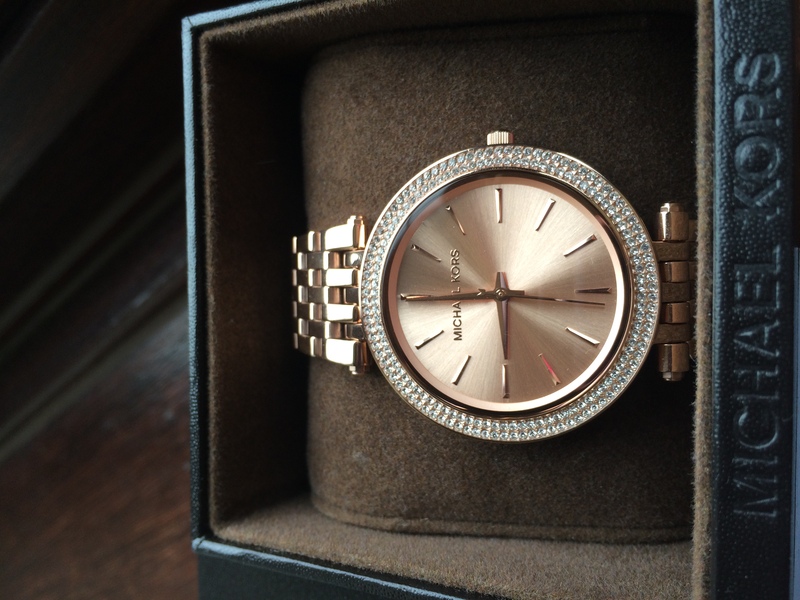 Received watch in 2 days and when I opened the box wow all rose gold and sparkle. 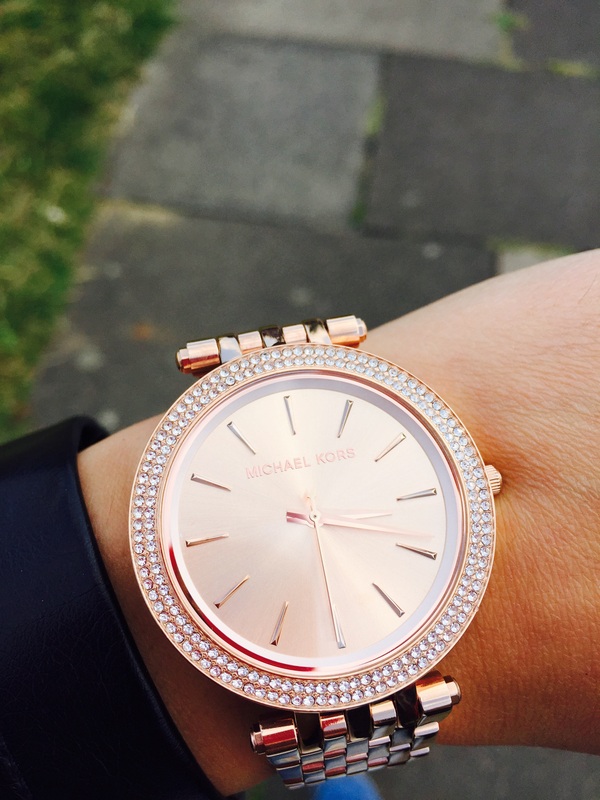 Fits perfect the rose gold face is clear so easy to read time marked Michael kors..... with sparkle round the face looks elegant. And noticeable.love it. Gorgeous watch the right colour matching jewellery I got for Christmas.Great delivery service you kept me up to date on my parcel arriving right on time.Great purchase ....Ill be back for more . I received my order the day after which was fab but Ive not opened it as I had it gift wrapped so I left it in the putter cardboard packaging seen as its a present for someone in March but I will write another review once opened. I dont usually leave reviews however I am so impressed by the service of watchshop that it would be rude not to. I was looking for a Michael kors watch for my wifes 40th and having seen this one in a high st shop my brother in law said to try watchshop. To be honest I had some doubts as the same watch was £80 cheaper than the sale price in the shop but having checked out watchshop on line I ordered. I was genuinely interested by the service. Ordered at 11.45 on Sunday I had an email advising it was dispatched at 12.15 and it was in my hands 9.10 Tuesday morning. Absolutely brilliant. Heres hoping my wife likes the watch although I cant see why she wouldnt. Keep up the good work watchshop I wouldnt hesitate to recommend you. It was a gift for my girlfriend for Christmas. This is what she likes about the watch: Classic and timeless watch with a big face, crystals and golden strap. It looks elegant on the wrist. I am only afraid about the crystals if they wont break, but it is too early to say so I will let you know in the few months if they are durable. Apart from that, the watch will match any golden jewellery and classic outfits - mainly black and white tops, dresses. You can also go casual, but I prefer to wear it with more traditional clothes. For the price offered, this is an excellent quality, and I couldnt find a better watch in this style for less. Overall, I am glad about my choice, and I am only afraid about the durability. Not sure if it will last for years, but for now it looks stylish, and its a great add-on piece that will make any creation look glam. As I first took a look at this product, I was amazed by the refined classic design of the face. How the watch still looks fashionably chic when worn. I look at the watch as a piece of jewellery not as a simple watch to tell the time. Really happy with it! Love the colour! Feel pride of honour every time I wear it. Thank you! I love this watch. I love the appearance and looks really sleek. Bought this watch as a gift for my girlfriend, really happy with the service. It was quick and easy, when it came it was gift wrapped beautifully. The watch was excellent quality and my girlfriend was really happy with it. Would definitely buy from here again! Service was excellent, The watch arrived the next morning. Excellent quality bought as a gift for my girlfriend and she is very happy with it! Brilliant gift. Good prices and speedy delivery. Great watch & looks lovely on her wrist. Fantastic watch, fantastic price, fantastic service. FANTASTIC!! Stunning watch. Looks so classy and elegant. And at a very good price. Fantastic quality watch. Wife really pleased with her Xmas present. Beautiful watch. Looks lovely and is very light. Simple yet stylish and matching , an absolutely fantastic purchase . Looks even better in real than on the picture , and is totally worth recommending. Great product, easy to purchase and quick and easy delivery. 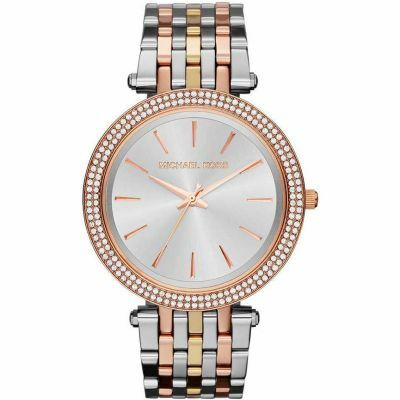 I have bought this watch as a Christmas present for my 16 year old daughter, secretly hoping that she doesnt like it so I can keep it for myself, it is a stunning watch. The watch is beautifully made and the detail is not too bling, the rose gold colour is true to the picture. Lovely item, great to be able to view from all angles. Photos were totally realistic so was not disappointed when the watch arrived. The watch that I got my girlfriend for Christmas is one of the best gifts to give someone, it stands out, its flashy and it fits on her wrist no problem. I found it amazing how it just fit without needing to go adjust it and it wasnt to small either. This is probably one of the best presents Ive ever gotten someone and the delivery was outstanding. Fantastic product, extremely fast delivery. Ordered on a Sunday afternoon, received on Monday! 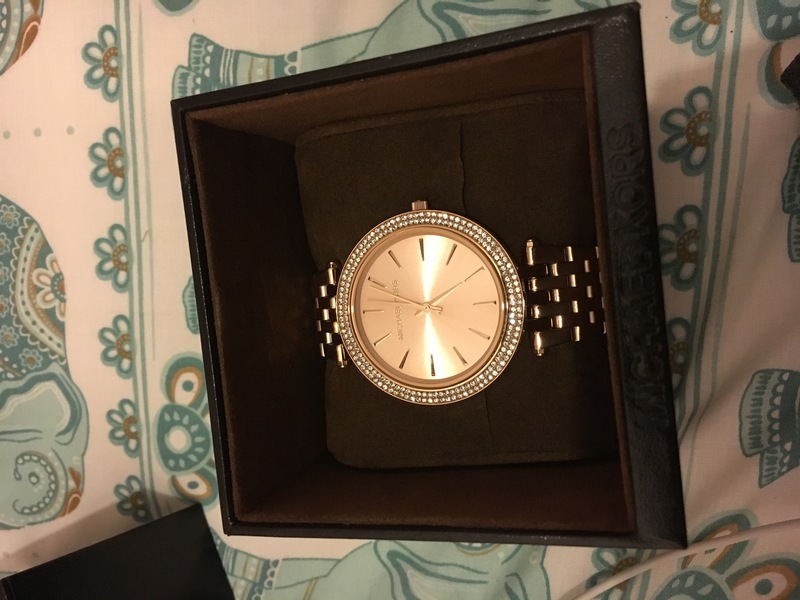 Bought this watch as a present for my girlfriend and she absolutely loves it, the rose colour is gorgeous and the quality is unbelievable, would recommend to anyone out there looking to buy a present for there wives or girlfriends. The misses has wanted it all year, finally it will shut her up, the watch itself is a lovely watch, the rose gold is a beautiful colour, the t-strap suits the plain but stylish face of the watch. Would recommend! Lovely watch, very girly and looks gorgeous on, would definitely recommend. Perfect for my 18 year old Daughter, large but not bulky, sparkly but not blingy. A very chic watch which looks lovely day or night with all outfits. watch is a present so cannot comment too muce but click and collect at goldsmiths went fine. watch is perfect and half the high street price. happy days. Excellent product and very fast delivery. The watch itself glistens with quality. Bought this is a present and have not been disappointed it turned up exactly when they said it would and Im very happy with the ease of buying this product and the smile I received when it was opened was unreal. Bought as a gift for my partners birthday, she absolutely loved it. The colour looks amazing and the watch looks a lot more expensive than it was. The delivery service was amazing too it arrived very quickly and I could not find the watch cheaper anywhere else. This was my first time buying from here and I will definitely buy from them again in future. Great experience. Easy to use website and product came in proper box etc. Very impressed. Very happy with watch, with very fast delivery. Beautiful watch promptly delivered and beautifully gift wrapped! Couldnt ask for more! Very easy navigation of the website and my watch was delivered the next day with very good packaging so it was not damaged and was in very good condition. Beautiful watch. Love the colour and style. Very good quality. 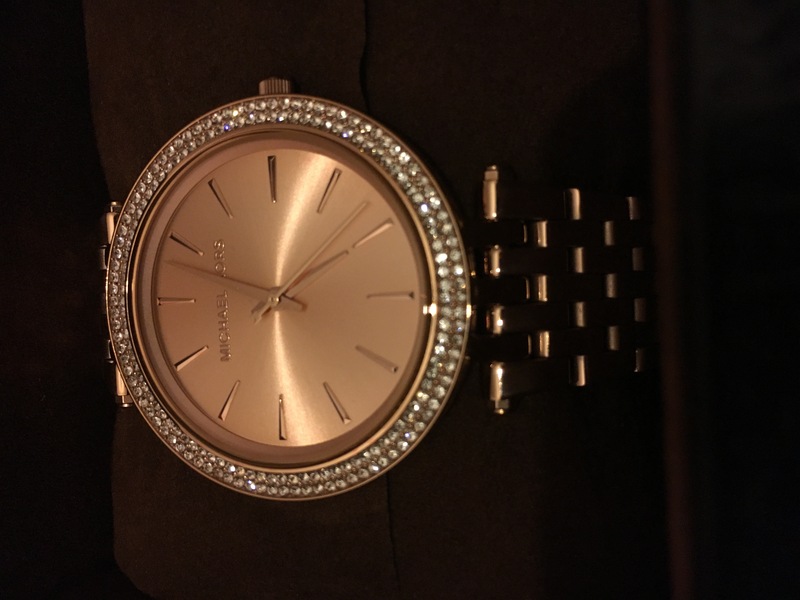 I brought this as a birthday present for my sister and she loves it, its fits her perfectly and looks lovely on her Im so happy with this watch and would recommend it! the watch came very quickly and looks perfect ready for Christmas. . Excellent service with extremely fast delivery to local goldsmiths store. Watch is a gift however is exactly as described and watchshop definitely is best value for money. Would definitely shop here again. An extra little Xmas gift for our daughter. Great priced value for money product. Fantastic service with super fast delivery of a beautiful watch. Recomended by a friend. Very impressed with the service. Next day delivery. This watch is actually indescribable - I fell in love with it as soon as I opened the box! The rose gold colour is perfect, and I could wear the watch with absolutely anything in my wardrobe. It has a simple design which is what I love most, the simplicity is the best feature! The diamontes around the edge just add a glamorous touch, and doesnt make the watch look tacky. The chain itself is very nice, it is very light and comfortable around your wrist. Initially I was hesitant to buy this because I thought itd look chunky on my wrist as I have a small wrist, however it looks perfect! The watch is light and easy to wear! 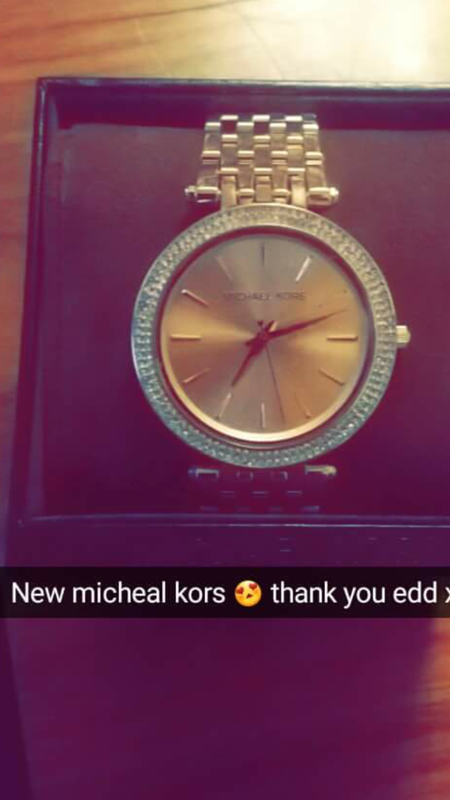 I feel it was definitely worth my money, as it isnt the typical Michael Kors watch that everyone buys, and watchshop offered it at a better price than other stores. I would definitely recommend to anyone looking to buy a Michael Kors watch that isnt too expensive, and simple but with an effective design! I was very happy with the price too! 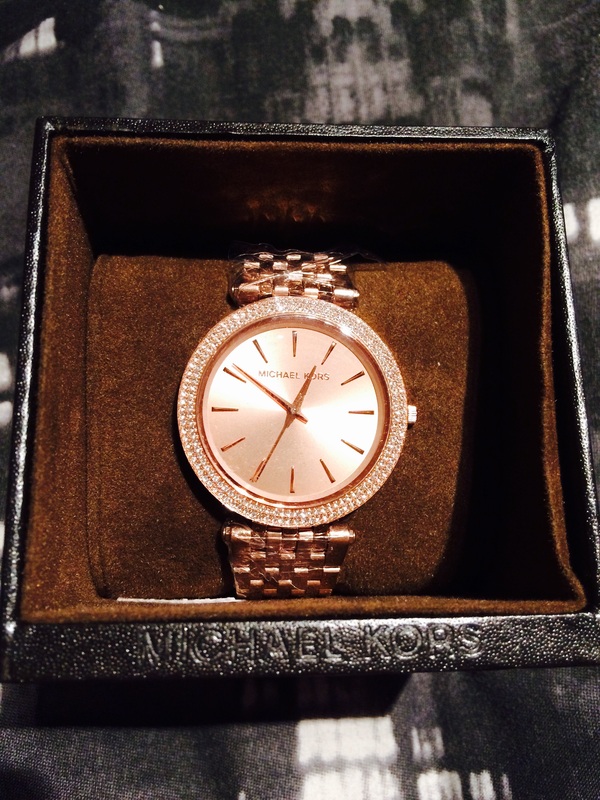 I chose this rose gold Michael Kors watch as an 18th birthday present. It is truly beautiful as well as being affordable. I decided to go for rose gold as it is very fashionable at the moment. However, I was concerned about what it would look like with my silver Pandora rings but once I put them on together they looked amazing. My favourite part about the watch is the quartz movement as it adds a subtle sparkle. I did look at a smaller watch face in the same style but decided to go for the bigger face as it suited me more. 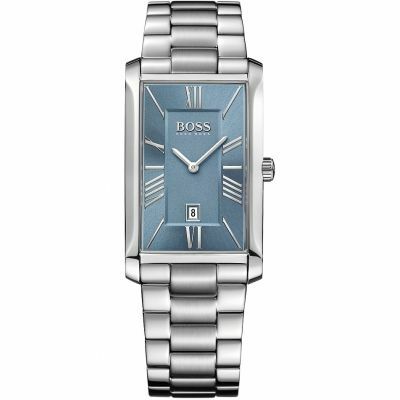 I would definitely recommend this watch for a female of any age as it is stylish and comfortable to wear every day. Amazing watch, girlfriend absolutely loved it and would recommend it for any birthday/Christmas present! Love it. My mum will love it. Got it for her for Christmas. Cant wait to give it to her. Excellent service and Gave wrist measurement and bracelet adjusted perfectly. Swift delivery too. It is exactly as it was shown in the website,and its amazing.My teenage daughter loved it as a birthday present! Bought this beautiful watch as a gift for my daughter. It has a lovely rose gold plating with diamante bezel on a lovely large plain face with the designer name in small letters, very subtle. Looks wonderful and luxurious and I am extremely happy with this purchase. Absolutely stunning watch. I bought this as a ten year anniversary gift for my wife and she cried tears of joy when she opened it! The one thing that I was slightly worried about was the size as its slightly bigger than the usual small size that ladies wear, but because this watch is so slim in profile it would look perfect on most womens wrists. An absolute bargain and I couldnt recommend highly enough. This watch is a gift for our 20 year old daughters Christmas. The worry when ordering online is that the picture is not a true representation of what you actually receive. 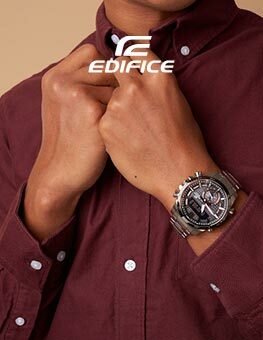 In this case however the watch is exactly as it appears in photo. It is beautifully made and not too large. A real statement piece which Im sure our daughter will love. Excellent high quality product, quick delivery. I couldnt have found a more perfect watch, having the Michael Kors rose gold bracelet and now the watch to match just look great together. The slim face style is definitely a preference of mine. And with the crystals around the face it adds that extra bit of sparkle. Definitely would recommend this for those looking for a beautiful and elegant looking watch. 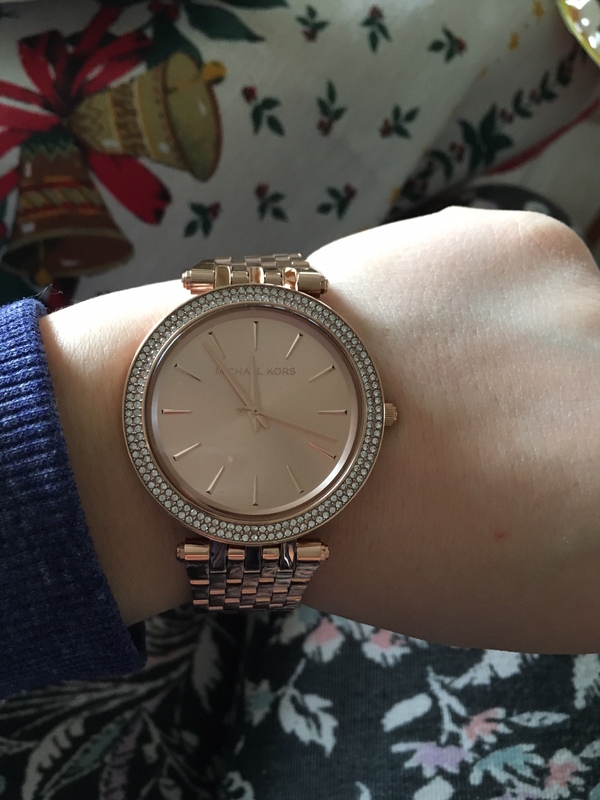 Bought this watch for my daughters Christmas ,we had seen it in our local jewellery shop I have received a great deal from you as it was £120 cheaper on your site  Fast delivery great service . Lovely watch. Really classy looking and fab price!Bought it for my daughter for her birthday. Will be looking to buy another one for a Christmas present. Made up with my watch very elegant , also very quick to arrive. 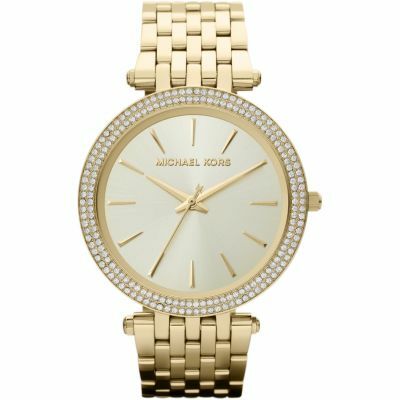 I love this watch, Ive been wanting a Micheal kors watch for ages and Ive finally found the perfect one on the perfect site! The watch came in perfect condition, no marks or scratches and well packaged! The delivery was also very fast! I really recommend! Very pleased! I received my rose gold watch that I purchased for my partner, the delivery was very fast and arrived in perfect condition. The watch over all is lovely and exactly how it looks in the picture. Very pleased with my purchase. The product is amazing, looks really good worth the money. Bought this gift for my girlfriend and it left her speechless. The face of the clock is sparkly and big so it caught her attention and everyone elses. 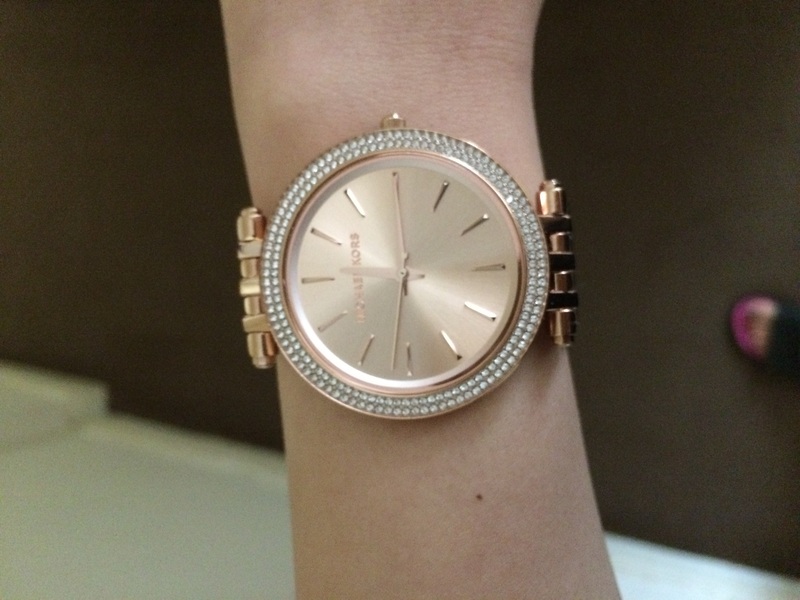 She loves the colour rose gold on watches and wasnt disappointed with this one. The colour is very noticeable on the metallic material. The watch is lovely! Watch shop offers really good value for mainly, MK is selling the same watch for around £220! Quick delivery and customer is informed all the time. Going to shop with watch shop in future again. 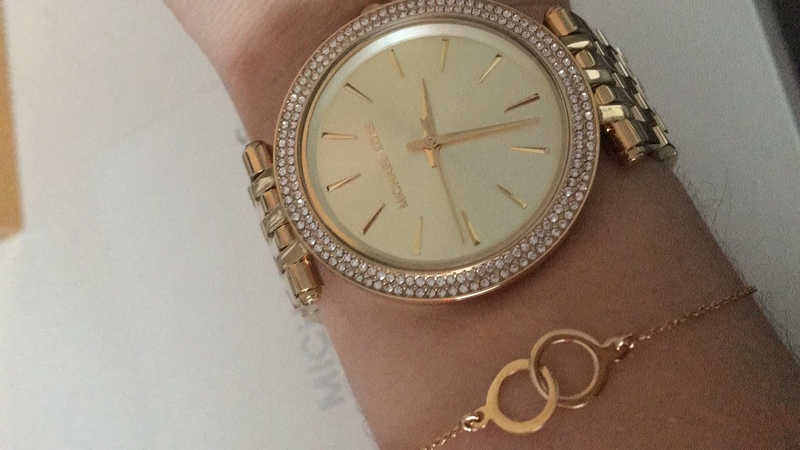 I bought a beautiful Micheal Kors Darcia watch MK3192 watch for my daughter for her 16th birthday. It was a last minute decision to get her this and I wasnt sure if it would arrive in time - it did. I am very impressed by the service I received from Watch Shop. I placed my order online and also spoke to a member of the team which I found very helpful as they reassured me my order had been dispatched and I would receive it the next day - which I did. 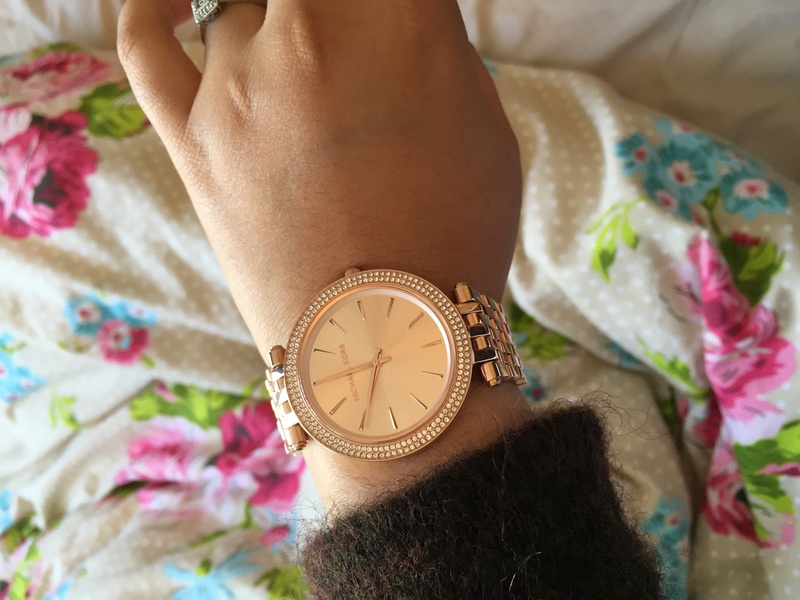 The watch is stunning, a lovely rose gold colour with bright shiny stones around the outside of the face, it looks so lovely on my daughters wrist that she went and had her nails done to show it off. I would defiantly recommend this company and will use them again. I have a very happy daughter!! Thanks Watch Shop. Really happy with product, great quality and beautiful watch. Its an extremely gorgeous watch but its SO big! I didnt realise the dial would be as big as it was 40mm so didnt look so tidy on my tiny wrists! Nonetheless its a beautiful watch and would recommend it to people who like fairly big dials! Very nice watch, met all expectations. I absolutely love my watch!!!!! My favourite piece of jewellery by far!! It is so sparkley and I cannot stop looking at it all day, i am officially in love with this watch and believe everyone should have it becuase it is so AMAZING!! The rose gold colour is amazing and even goes with my silver rings, the jewels are real swarvoski which makes it even better!!! 10/10 watch definitely!!! I bought the Michael Kors watch for my youngest daughter for her A levels for all the hard work she had put in, she was thrilled with the design and style which is a compliment in its self from a teenager the watch face style is ,timeless the watch appear exceptionally well made and finished and will give her years of fond memories of her excellent A level results and how proud her parents are. Was bought as a present, lovely watch. Delivery was quick and efficient and was well packaged. Beautiful watch. Extra links provided just in case. The rose gold is a gorgeous colour. It was a presant for my daughter on her 21st which she personally chose. She has tiny wrists but this watch is perfect for her. I fancy one now .!!!! This watch was exactly what I was looking for. It fit my wrist nicely and the watch itself was not too big nor too little. It was a good size. The colour is also as Id hoped as it was rose gold and looked it where in some cases most watches of that colour look faded. My one problem was that the clasp bit of the watch was a bit long which meant that it made the watch stick out near the clasp which I would have liked to have been flat on my wrist. But, because it was underneath it meant that it wasnt that noticeable. Overall, I love the look of the watch as it is so simple yet still has that good looking quality about it. Definitely recommend getting this watch if you like something simple yet still fashionable and suitable for all occasions. I got this watch within 2 days, service is super fast,they also fixed the size of the bracelet,and i m loving my watch,its enchanting.. Outstanding service. Arrived early next day. Absolutely delighted with my purchase which was a birthday present for my daughter. She is a very happy young lady now! Thank you. My watch arrived within 24 hours and I was delighted with it. It was exactly as described. Paid extra for next day delivery, arrived 3 days later. Glass was slightly chipped on the face of the watch. Its an excellent watch for the price I payed, as I would have been paying £150+ elsewhere. I just loved this watch when i saw it even more so, when it arrived and i opened the box. The rose gold colour gives it a very feminine touch and the styling is very very sophiscated. Its a wonderfull addition to my MK watch collection. The service from watchshop was as flawless as ever. I cant stop recommendimg this site to my friends. Thank you watchshop. Lovely watch but disappointed with the box it came in. The watch was forced into the box and I had to ruin the box just to get the watch out. The process from ordering to receiving the watch was so straight forward, this was a gift for my Mothers 70th Birthday and I have to say that she was delighted! Beautifully packaged and exactly what we were after, I have been so impressed with watchshop I will be back for more in the future. I felt safe to order from this company as I had checked all the reviews just to be sure. The whole experience has been faultlessly easy , thanks. I love the simplicity of the watch with not too many dials in them, I looks great on me.It came in a beautiful case and above all the watch can be adjusted free of charge in goldsmith stores. The watch is absolutely stunning. The beautiful rose gold goes well with any skin tone and the crystals around the outside of the face of the watch add sparkle to the watch. It is seen as more of a bracelet with its glittering features and is brilliant for everyday use and for special occasions. To keep it save it comes in a lovely dark drown box with the Michael Kors brand on it so you know its the real deal ! I am very pleased with my product and would recommend it to all my friends and family. This is a beautiful well made watch. It was bought for my mother in law 70th birthday she was delighted if it. But my teenager daughter also wants this design. Its a large watch but very classy. The delivery service was brilliant very fast and emails to update. Excellent service the watch arrived the next day, no issues at all. recommend this site. Such an amazing good quality glam watch! Its such a lovely watch to wear on special occasions or even everyday! Its rose gold with diamonds around the edge of the dial. The strap is plain which adds to the attention of the clock face! Bought this watch for a Birthday present for my daughter, she is absolutely delighted with it. Delivery was next day as advised and I was updated on the delivery. Goldsmiths were also good as needed a couple of links removed. This is my first purchase from the Watchshop but will definitely not be the last . Would thoroughly recommend. This was a birthday present for my sister. She loved it! Really good value for money and worth buying. I finally decided to get this watch for my birthday. It looks beautiful in real life the picture doesnt do it justice. Delivery came quick. Had to pay for some links to be taken of but Watch Shop gave me a full refund once I sent a copy of the receipt. Will definitely recommend it for anyone looking for something classy. Lovely watch. Bought two. One for my daughter for her 40th birthday and liked it so much I purchased another one for myself! Love it. Really classy. A great purchase thank you. I dont write reviews and I cannot make any comments as this is a gift for my nieces 18th birthday at the end of the month. The service provided and speed from purchasing the watch to when it arrived was brilliant. Couldnt be more happy, second time I have purchased from the watch shop and highly recommend it. 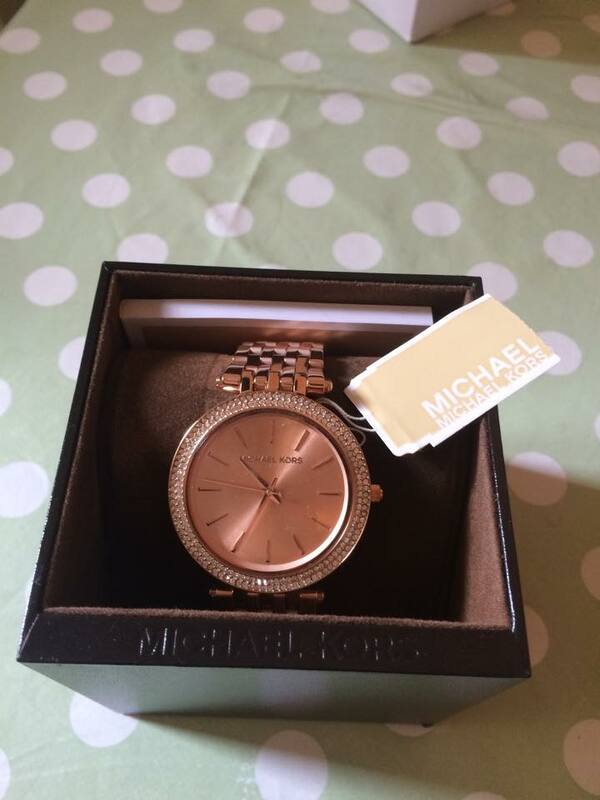 The Michael kors Watch is of good quality, its very pretty in the Rose Gold Tone, its quite a simple design, perfect for someone who likes a little bling but not over the top, only regret is that the watch was not supplied with a date stamped card just the invoice that Im told serves the same purpose. Do not regret my purchase and i never will! Gorgeous watch and great packaging and service. A simple but very sleek, elegant looking watch. Slim and clock face not overly large. Bought for someone with small wrists and only had to have a couple of links taken out and now fits perfect. Value for money as looks a good quality watch. The Rose Gold colour is really nice. Would buy this make again. I love this watch. It has beautiful features and looks lovely even on smaller wrists. I have a quite small wrist and big watches never suited me so I always wore very small watches. This one however was a perfect fit and I was finally able to wear a bigger watch than usual. Thanks to watch shop I was able to into one of the Goldsmiths stores and get the watch fitted free of charge in less than 10 min. Im very very pleased with my purchase and I recommend watchshop to almost anyone in my family and friends circle who mentions to buy a watch. 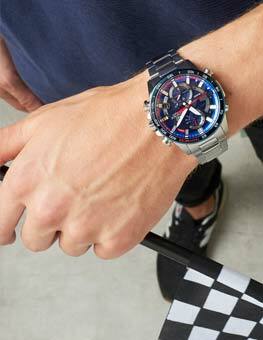 Watchshop also has a huge variety and many of them arent on the high street so I prefer this online store and recommend it to everyone. Beautiful watch. 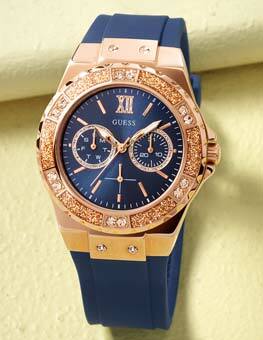 Rose gold strap and face. Looks stylish on. Strap bit small. Some stones bit wonky. Have sent back but am re ordering same watch as I love it. Ive just purchased this watch it is beautiful Ill recommend. I absolutely love my new watch. Been looking at Michael Kors watch for a while and saw THE ONE and had to have it. I wasnt disappointed. The watch is gorgeous. Didnt need any links taken out...it was meant to be. Beautiful big face and very blingy...love it love it love it. Dont hesitate in ordering this watch. Absolutely over the moon with this watch,the colour enhances the diamantés around the edge of the face and the quality is outstanding...Love it! I was surprised by the price which watchshop was offering then compared to other sellers . 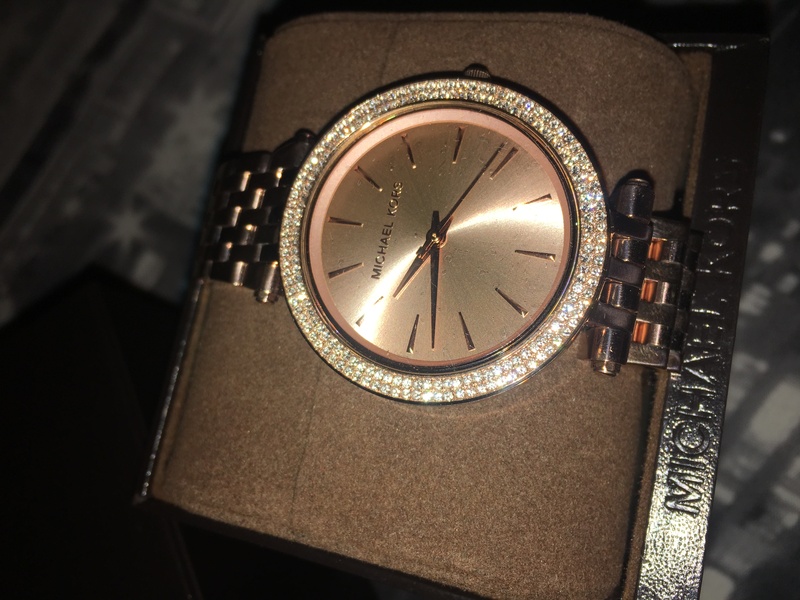 I got this as a gift for my wife on her bday and she is happy with the mk watch. Thank you watchshop for delivering on date. I ordered this watch for my girlfriend as it was out two year anniversary it is a beautiful piece and it jumped out at me when I was searching for what to buy her. As guys know its hard to find the perfect gift for your loved ones but I can safely say that this watch is truly stunning and I would recommend it to anyone. The watch was brought as an Christmas gift for my daughter, shes wanted this watch for a long time and is delighted with the colour & style!!! It fits beautifully on her arm and the rose colour complements her skin!!! cant praise this watch enough it is stunning and I absolutely love it. The diamonds detail around the face gives it a real dressy feel which was my main reason for buying it along with the strap which isnt too bulky and feels elegant. The price was fantastic, nearly £100 cheaper than anywhere else Id seen it and the whole order/ delivery process was spot on. Brought for daughters bday & she loves it. Its a really beautiful watch & will defo use watch shop again. & service was excellent. The product came in fantastic condition in its own Michael Kors box. Exactly what it looks like from the images and now I can say Im a proud new owner of a MK watch! Amazing Service - Excellent Product. I order this watch on Monday afternoon at 2.30 pm and it was delivered to me in the West of Ireland at 12.20 pm on Tuesday the next day. The watch was exactly as ordered. It is a present for my daughter and she is absolutely thrilled with it. The price was far better than anywhere else - either on-line or in our local jewellery shop. I look forward to using the WatchShop again in the near future as I need a new watch for myself. Lovely watch nicely boxed. Looks even better in the flesh. The detail colour and finish are superb. I bought it for a surprise, she was over the moon. Superb service over the busy xmas period. Ordered one day ,received the next.my wife was thrilled with the watch, we had the watch fitted in town the following weekend and she hasnt taken it off her wrist since.Happy days. Beautiful watch excellent price and service thank you. Very pleased with my purchase prompt delivery to shop.Watch is exactly what I wanted .I love it!!! watch came on time for christmas. daughter delighted with her watch. will need to get a few links taken out as its too big for her wrist. Bought this as a present for my wife after several heavy hints. 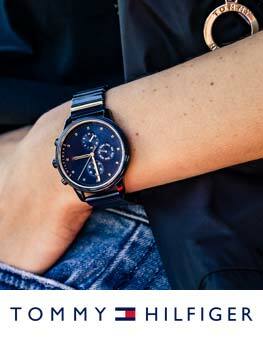 A really nice watch that is close to double the price on the high street. Face is slightly larger than my wife would normally wear, but having checked it out in the local jewellers first, decided it would be OK. Build quality looks good and I wouldnt hesitate to recommend this watch. May not be suitable for those with a very small wrist. Excellent service watch was delivered on time and was value for money. Put a smile on my wifes face Christmas morning. I bought this for my sister and she absolutely loved it! The quality of the product, was and is, excellent as always and it exceeded expectations on all fronts! This watch was delivered on the date said and was an amazing christmas present, the watch not only is in perfect condition but any correspondence Ive had with the Watch Shop has been nothing but professional and I wouldnt hesitate to buy from them again. Brilliant product! The watch was beautiful, boxed as it should be, fabulous service via click and collect next day actually. Will def use again, brilliant service, brilliant price and gorgeous watch. My daughter was over the moon!!! NIce watch, looks great on, not too big. We thought the face might be too big for my wifes wrist but looks great, perfect size. I bought this watch as a christmas gift for my mum. Shes over the moon with it. Its a really nice watch. Its stylish, well made and a unique colour. The delivery was super quick. Come the very next day from when I purchased it. Im oing to use watch shop from now on! The watch is of fantastic quality and was really a stand out present for my wife this Christmas. Excellent item I bought this as a gift for my other half and she absolutely loved it. Stunning! Very nice watch. Love the fact that its just a simple watch in there is not too much on the face of the watch i.e. extra dials, dates etc. which was ideal because my girlfriends wanted a new watch for work so I bought it for my her for Christmas and she was really happy with it. It is a very nice rose tinted colour and according to her it is very comfortable to wear and looks very smart. I bought this watch for my partner for Christmas as one of her main presents. Christmas morning came and needless to say she was delighted with the gift. 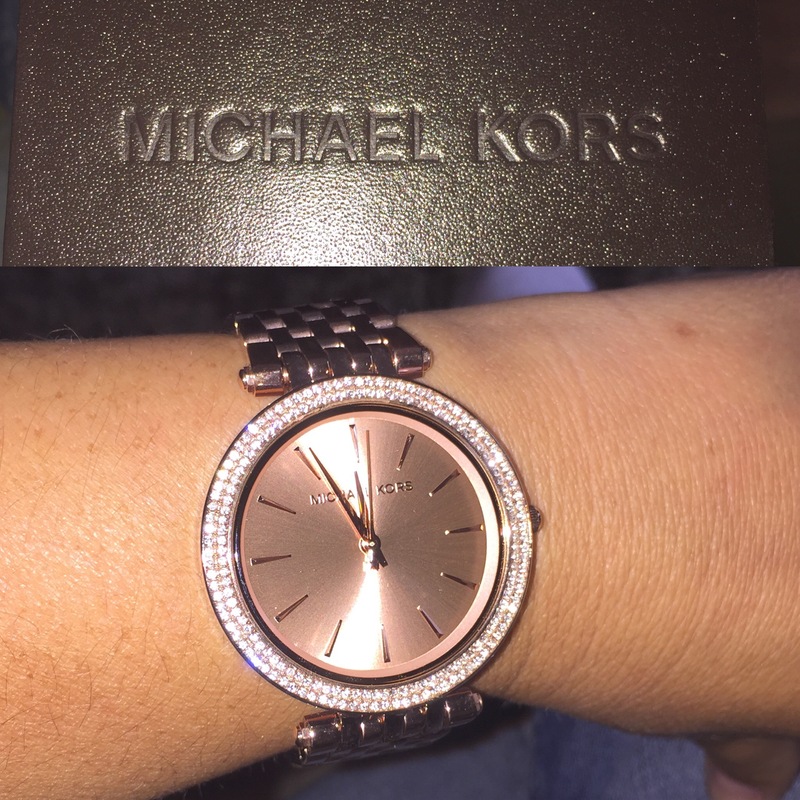 She has loved Michael Kors watches for some time now as she likes the rose gold finish. This watch is fantastic quality and looks really elegant, and the price that I paid was much lower than any high street shop and fantastic value for money. I ordered from watch shop and the item was delivered to my local goldsmiths store 48 hours later, just in time for Santa coming! Id definitely use watchshop again as the prices are seemingly unbeatable and the delivery and service is second to none. Thanks watch shop for making my Xmas that bit easier and more enjoyable! Love my new watch, excellent value for money!! Great item..Im sure my fiancee is going to love it.fast delivery..highly recommended. I bought this watch as a present for my grandaughters birthday. I had bought the same watch for my daughter and they both were delighted with the present and though the watch was both beautiful and elegant. This has been purchased as a xmas present so cant review the watch itself. Looks great and Im sure my daughter will love it. Great service from the watchshop as per usual. Excellent order and tracking service. Delivery is quick. I always tend to use watchshop providing the price is right. Lovely watch, much cheaper than The recommended price. Arrived quickly. Outstanding present for the girlfriend totally over the moon with it cant wait too see the look on her face when she opens it at Christmas !! Ordered a Michael Kors watch Black friday, delivered the Monday morning 07.15am. Excellent packaging, excellent service and excellent value. Second watch ordered from this shop this year and would thorougly recommend. Very good product quick swift delivery with no problems what so ever. Especially around Christmas time! Beautiful watch, delivered very quickly and at an excellent price. The watch arrived next day. It was bought for my wifes Christmas so she hasnt seen it yet. I am sure she will love it as it looks fantastic in the box. Fantastic service, great prices and brilliant delivery speed. Great watch,great price really quick with delivery always kept up to date when it was dispatched. I bought this watch as a Christmas present for my girlfriend and I have to say its excellent. The colour of the watch is great and the design and style is simple and not too complex. The watch was great value for money. This is a fantastic and stylish designer watch at a great price. My wife was very pleased with this purchase. I have never purchased any Rose gold jewellery previously before. It is so nice and glad I chose this. This watch is absolutely stunning. Also I would 100% buy from watch shop again as I got my watch delivered to store. I bought the watch and the next day it was in store, I also got the watch fitted to me for free the same day. I will defiantly be recommending people to shop from watch shop. Also can not wait to show my watch off. Its perfect. Everything from order to delivery was fantastic ordered watch Thursday afternoon received watch Friday morning when I ordered the watch it was said we could have free alterations on the watch but nothing came to tell you where to get it done. Beautiful looking watch, very pleased. Absolutely stunning piece, delivery was very fast and I am more than happy with the service I recieved. It is amazing. I bought it as a gift for my sister and it was beautifully wrapped and was sooooooooooo stunning. I was really pleased with the watch. I have bought it as a gift and was hoping it looked as good as the photos. I wasnt disappointed as it looks elegant and stylish and I love the colour and clear face. I bought this watch as a bday gift for my better half, She absolutely loved it. It looks perfect on her wrist. It goes well with any outfit. The service from watch shop was brilliant, i was able to collect the order within 3 days of purchase right on the time. Thank you Watchshop. Excellent service, beautiful watch and very fast delivery! Response from customer services was brilliant! The watch was exactly what I was looking for and easy to find with lots of choice. 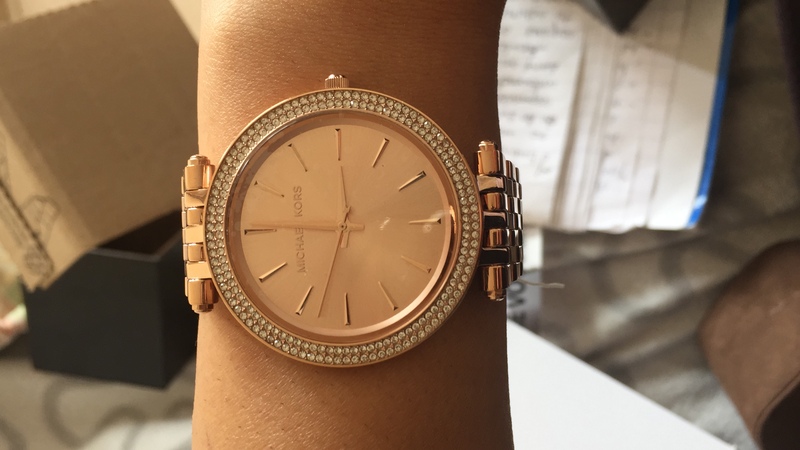 I specifically wanted a rose gold womans Michael Kors watch with a thin strap, round face and simple design! fantastic service, I have used this shop many times and will again with no hesitation. Fantastic product. Fast delivery! Definitely will be using again. This was bought as a present and it proved difficult to hand over. Its stunning. I have requested one in yellow,gold for Christmas I was that impressed. I have to admit I did try it on and it is a classy looking watch. Another Michael Kors winner. The rose gold colour is stunning but as I have quite a few rose gold watches I have requested thus version in yellow gold. You will not be disappointed. Bought this as a gift for my girlfriend and she went mad over it, would definitely recommend this! Will definitely buy from this seller again. Amazing. The customer service was great when I called up watchshop. The fit is what I wanted. Everything is 10/10 for the product and serivice. Very pleased with this watch I purchased. The watch itself is pretty, my girlfriend loved it. Also the price was great. Watch Bought as a Birthday present for my daughter. Nice product, well packaged and delivered next day even though it was ordered on a sunday!! Excellent service! Ordered it at around 5pm and it came the next morning. The best delivery service Ive had and it was free of charge. It was packaged securely which I was really happy about and the watch is beautiful. Lovely colour and it came in perfect condition. Definitely recommend buying from watchshop as its much cheaper than buying from MK/Beaverbrooks etc. Saw this Michael Kors watch on a shop assistant in one of the top retail jewellers. Looked so classy and elegant. Watch Shop price was much cheaper than the jewellers....so it was an easy choice to purchase Am very pleased with this watch...lovely warm rose gold tone...peachy coloured face...crystals around the face.. classy and alittle blingy with not being over the top. Lovely everyday watch and would suit every age group. Am a very happy customer. Very pleased with service, watch more than I hoped for, looks real classy. Watch is lovely- perfect size so it doesnt look too big. Really happy with this purchase. Nice watch colour and style perfect for my sister. Prompt and detailed information confirming the purchase, delivery progress reporting excellent, will definitely purchase from the watch shop again. I baught this for my best friend for her birthday, she loves the watch. So beautiful and elegant. Fast delivery watch was also adjusted to wrist size, excellent service. I always buy my watches from here. Bought it as a gift for my mum and she was exceptionally pleased with it. She never really wore a watch but she says she loves this one. It is perfect. Love the rose gold finish and the face is not to chunky. It is very sleak and stylish. This is a great watch, very lightweight and fashionable and my wife loved it as her 30th birthday present. Very smart watch! Bought for partner and she loves it! 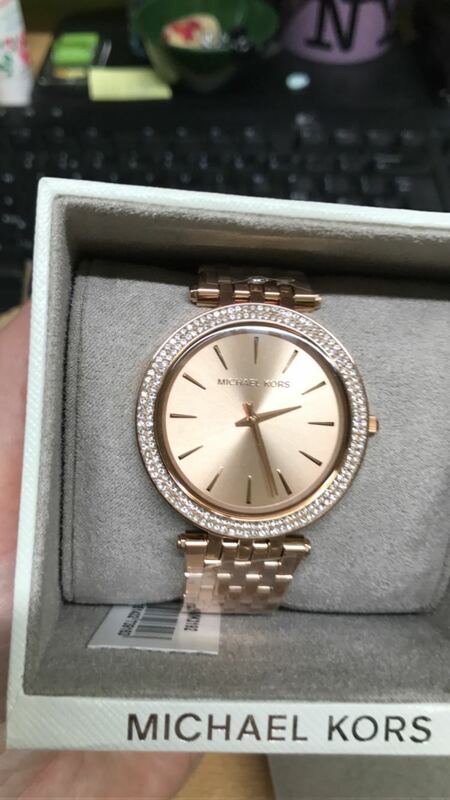 Bought this Michael kors watch for my daughters birthday, you can get the watch in different coloured metals, beautiful watch with stones around the dial! Many people have commented on my daughters watch! Would recommend this watch and the price is excellent! Priced it in some jeweller shops and its about £50 cheaper would definetly recommend this web site Ive used it before and will certainly use it again! One thing I like is you can request that your bracelet has links taken out when you order it online I knew how many because Ive bought Michael kors watches before so knew how many links I needed taken out! Excellent website would defo recommend! An excellent product and excellent service. Watch has Beeb bought for a 21st birthday present. The strap had to be adjusted and this was done and the spare links sent with the watch. The watch looks superb and will really make my daughters day. on the hand it looks much better than in photo! Color and desing is very cool! Im so happy to chose this watch ! Absolutely love this watch. Its so elegant, matches with every outfit!!! I love the fact that its rose gold and its not a heavy watch at all! I would recommend this to those who like to add a bit of glam to their outfit as it doesnt stand out too much. The watch is very nice and sleek. Looks very elegant and classy. It doesnt have a bulky dial which is what I love most about the watch. I like the strap of the watch as its just the right size in comparison to the dial itself. The crystals around the watch give it a very feminine touch. The rose gold colour is my favourite, however, both the gold and silver and very nice too. There is nothing I dont like about this watch. Its very beautiful. Anniversary present for my wife she loved it. Really nice watch, the gift was perfect for my girlfriend, she cried when she saw it! The watch is beautiful, really pleased. Beautiful rose gold simple yet elegant face with stones around the face. 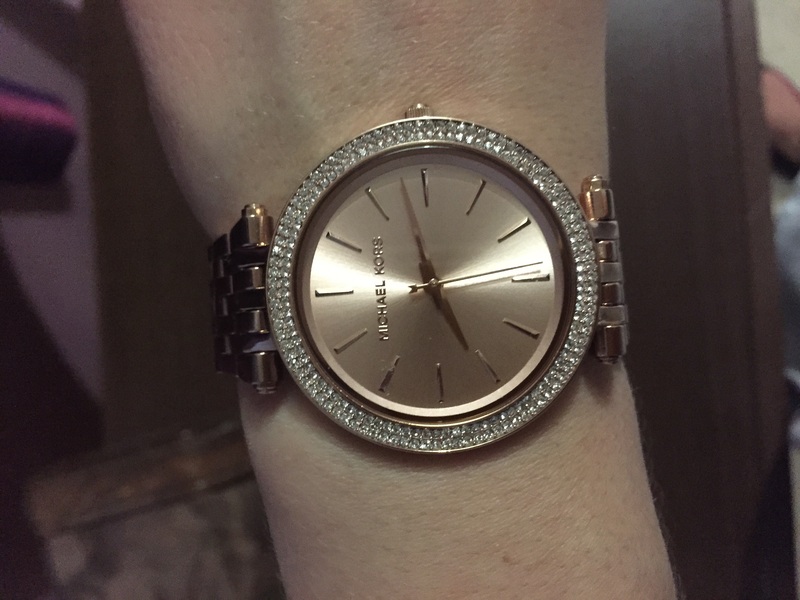 Bought this Michael Kors rose gold Darci watch for my daughter for her 16th birthday and both she and I are more than impressed with the watch everything is quality, it came well protected with the well designed and stylish Michael Kors box without a scratch or dent. The watch itself is a good weight not flimsy with a easy to use fold-over clasp, it looks sleek and stylish in a rose gold finish with a Set Crystal edge finish to the watch face giving it a subtle glam but not over the top look, overall I am more than impressed and at the price this watch is a must for any stylish woman of any age. I love this watch. Everything about this watch is just amazing. The color, size, look of this watch.My husband bought this for me as a present for our tenth wedding anniversary. The watch is well made and very expensive looking. The diamonds give just enough glitz without being flashy. Very stylish, elegant, eye- catching watch. Lightweight for its size. Great to dress up or casual. Picture has no justice. I was totally satisfied. I highly recommend it.Fast delivery too and great service . Five star for everything. The watch was a gift for my sisters 21 birthday. She loves the way it sparkles when the light catches it. It can be worn during the day or goes with any outfit for a night out. What can i say , an amazing watch at a fantastic price. This is a 21st Birthday girft for my daughter, She is going to love it. Product arrived very promptly. I did notice a slight Mark on the watch face but emailed watch shop who explained process and I got a replacement within a few days. The watch is gorgeous- very classy and love the Rose gold colour. It goes with everything and I like to mix and match it with other coloured metals and still looks great. Very stylish watch perfect for a younger woman, loved the look of the watch the colour and feel of the watch on my wrist. 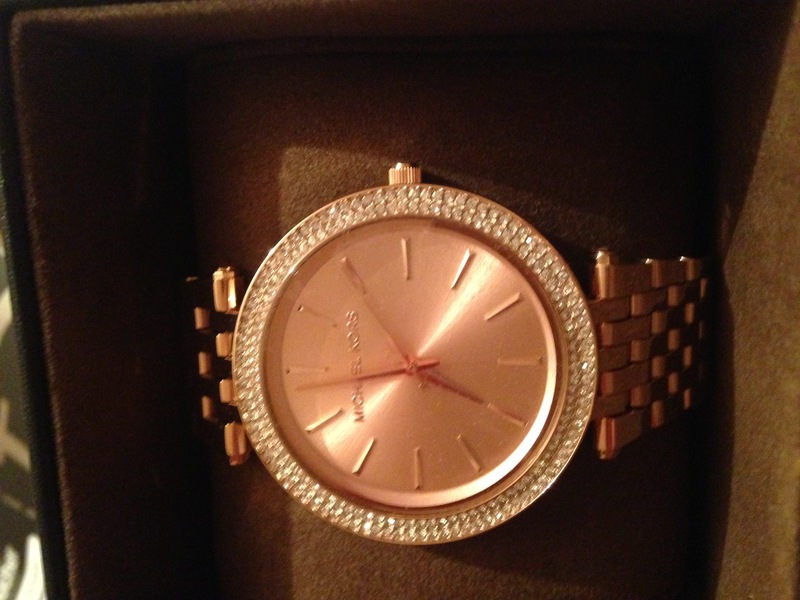 Soo very pleased with the Darcy Michael Kors watch recently purchased. I bought this for my grandaughters 18th birthday. I bought one in USA a few months ago for my other grandaughter who loved it. So glad I found it at The Watchshop. Watch looked much better than expected, was a gift for someone else and they loved it. Beautiful watch. Have had a lot of admiring comments. Beautiful rose gold colour not too pinkyin colour just perfect. Bought for my 21 year old daughter, absolutely beautiful watch and can not fault any part of it. I am very pleased with the product and service from Watchsop. This was my first online purchase for a watch and I must admit I was a bit pessimistic about what the quality of the product or service may be like but thought id give it a try anyway as it was a good price than other high street jewellers, and I havent regretted a thing.It came in a secure packaging with a tamper proof seal , delivered in good time and a plus point was also offered a free bracelet adjustment or the option of getting it done from my local Timpson store for £6.25 and receiving a £5 discount from watchshop which was processed promptly. All in all one happy and satisfied customer who will certainly be using you for future purchases no doubt and recommend to friends and family.Thank you. Product is very high quality and looks stunning. Bought as a gift and was very well received. 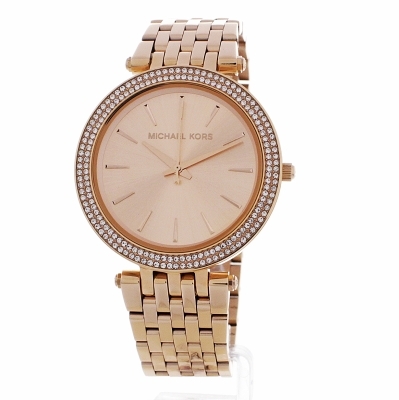 Michael kors watch rose gold, plain style watch. Stands out and looks nice on. 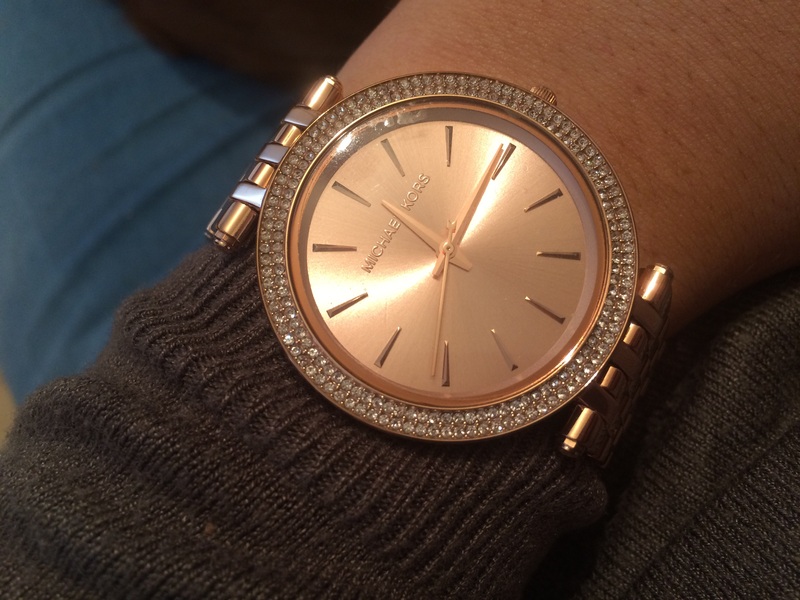 Having looked at other styles of watches I decided to look at the Michael Kors range. I was not disappointed as the were stylish and suited the design my wife was looking for in a watch. It also went along with Michael Kors bag. The watch is gorgeous and really suits my skin tone. Looks very elegant and i keep getting conpliments when i wear the watch. Its just perfect for my wrists as i have a small wrist. Beautiful , elegant timepiece just the perfect 21st birthday gift for my daughter ! The rose gold colour really made this particular watch stand out for me, with a clear face and just that little sparkle of diamonds perfectly surrounds the watch face . Was delivered within 2 days of ordering - excellent service. Highly satisfied with purchase of the watch and fast delivery. Excellent Christmas present and granddaughter was very happy with it. Bought this item as a gift for my girlfriend which she loved. The overall style of the watch makes it look simple but edgy & the rose gold compliments most things. There is nothing much bad to say with the watch as of now, what you see is what you get which isnt like most online orders, your paying for quality & many watch stores dont actually stock this particular rose gold colour and if they do its at £209, as u can see your saving £50 buying it from here. Quick and easy to order, came within three days of ordering. Beautiful watch lovely face and layout. The size of the watch is very big but thats not a downside its just a one size fits all so it had to have a few links removed. It was a present for my sisters 18th birthday party and was over 70 pounds cheaper than what it was in jewellers. She adores the watch and has literally never had it off. It was all in all a great purchase and worth while I would definitely recommend this watch and website to friends! I bought this for my daughter as a present, she is over the moon with it. The rose colour is especially beautiful ans in our opinion the best in the range. You can feel the quality of it and is well worth the money. Beautiful watch from Michael Kors. 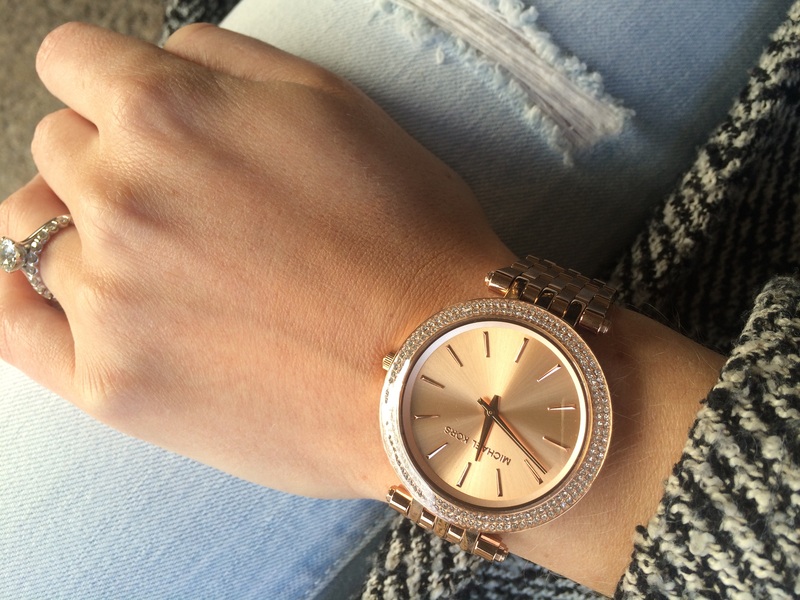 This Darci watch has a beautiful plain pink face with a ring of sparkles around it. Girlfriend just loved the watch. 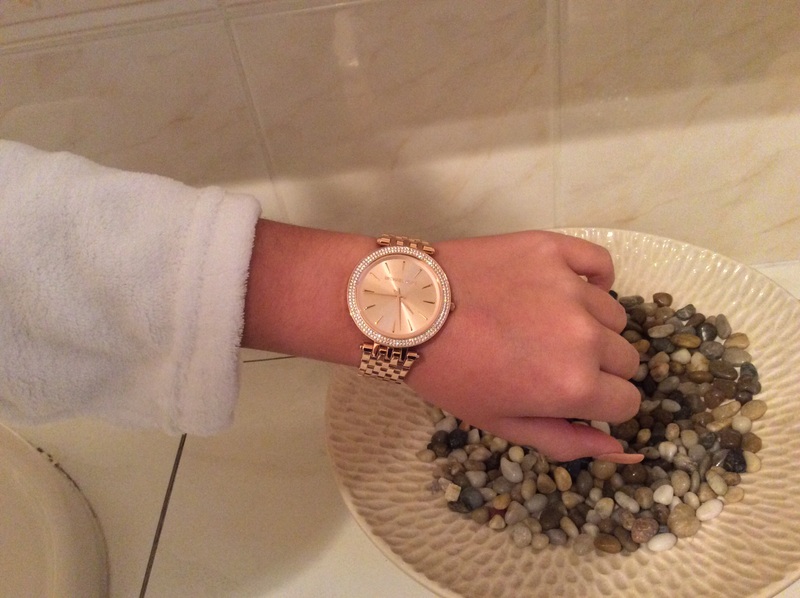 It was a Christmas pressy..
Beautiful watch in Rosé gold and surrounded by small stones. Really elegant . I was very pleased with it and the size of the face being uncluttered by so many dials. Unfortunately my wife decided I was too nice for her to wear on a daily basis and although she likes a littl bling this was a step to far for her. It is a very stylish watch and I am sorry she didnt go for it. Very impressed with service and speed of delivery. Item bought as wifes Xmas present and have to say she was blown away by it as was I by the price! Would Definatly recommend WatchShop to someone else or use agin myself. Cannot fault them. The recipient was delighted with the watch as her Christmas present - and it has never been taken off her wrist since 25/12. Bought for a gift. She loved it. Bracelet size adjusted and delivere on time. Good customer service. I bought this watch as a Christmas gift for my mum. It is much better in person and better than any other Michael Kors watch she has. The rose gold colour and the diamonds are perfect and it is not too heavy. We had to get a link removed but thats like £3 from timpsons. The watch is very eye catching and my mum has had compliments ever since she put it on. The colour is amazing in the sun and it apparently goes with everything. The watch face is plain and simple and looks very stylish. The watch has diamonds around the watch face . My mum absolutely loves the watch. At first I wasnt sure if it would be nice cause the pictures on the website look plain but it is absolutely stunning .Overall the watch is perfect and gets 5/5 for everything. Ive just written a review but would like to add a little more as i have just read you can give your wrist measurments and you can adjust watch before despatch why dont you make this servie more clear to your customers whilst the are purchasing online and also ive just noticed you have reduced the watch. Do you give free vouchers for strap alterations and where to go. Bought this watch for my wife for christmas she loved it. There wasnt any instructions about making the watch smaller. Someone did state in one of the reviews about a voucher or where to do this. Overall the purchase and delivery was excellent. Excellent watch my wife loved it. Brilliant Christmas present and the quality of the watch is first class. Can not fault it at all. Nice weight, good fit, looks brilliant.watch is very good quality and the rose gold is a nice colour. A really lovely looking watch at a very good value. Would definately recommend to others to buy this. I purchased this item for myself n im amazed at the product its beautiful n price was very reasobable for the quality of product.it fits well after ive had it adjusted which can be done easily at any jewellery shop. Brilliant looking watch, exactly what I was after as a Christmas present for my partner. Beautiful design and great quality! Top job. 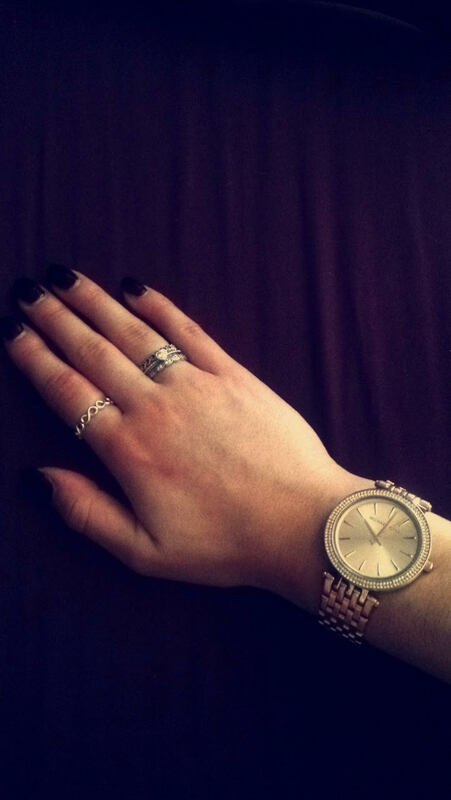 Love this watch, the size of the face is perfect even if you have small wrists like myself! ive been looking for a rose gold watch for months and this was perfect, it goes with everything and I love the details on the watch! Was really pleased with this purchase,wasnt sure about buying from just viewing online but glad I did,its a very nice watch and I would say if you have any doubts dont worry,order it if you like the look of it! Excellent watch sleek design and looks much more expensive than what it costs. Would recommend it to anyone looking to gift there wife or girlfriend. Great product, does the job, rose gold, colour deeper than the stock image gives it credit for + in at the moment. The watch I recieved was exellent quality and I loved it. The qualities i admire about the watch include the colour which was exactly as I prefered and hoped for. Also I loved the the face of the watch which was very elegant and admiring. The only feature I wasnt too fussed on about the watch was how wide the strap was I would of liked it a bit smaller. Overall a really great product from the Michael Kors range. Great Christmas present for the girlfriend. Good quality and very quick delivery. Very impressed with the watch itself, delivery and price! Wanted to buy this for my wife for Christmas. After hunting down the watch in a number of shops I was happy to buy it. Just thought would check online first and came across this site. After looking through the stock I found the watch I was after. And then I saw the price and it was £60 cheaper with free next day delivery. Im a very happy customer and fingers crossed so will the wife. Absolutely brilliant product. very happy with it and along with the great service from Watchshop. I ordered a micheal kors watch was worried it wouldnt look as good as the picture. When my order arrived I was more than happy with what I received the delivery was very quick. I bought the watch as a chrsitmas present and can not wait for it to be opened! A very stylish watch that looked good on my wifes arm when we collected it from Goldsmiths. It was just what she wanted for Christmas. The colour was just right and the stones round the face were not over the top. A good choice at the right price. 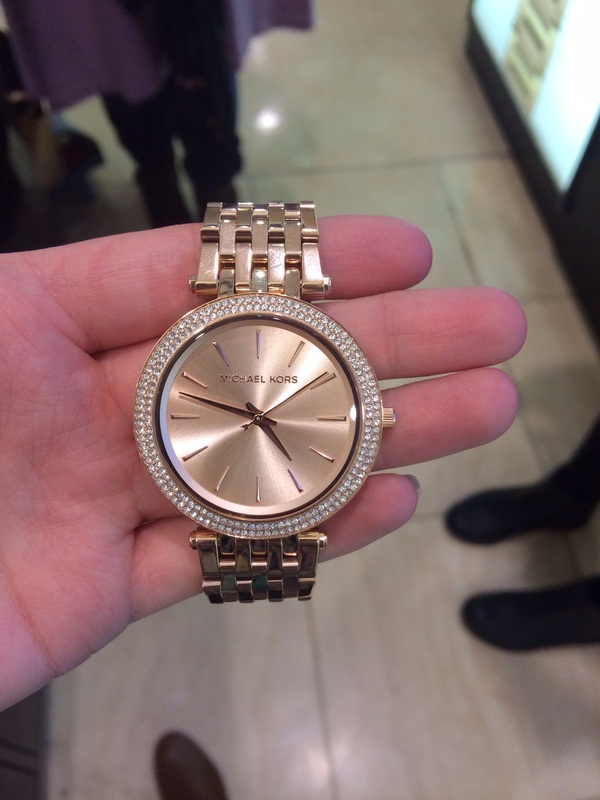 I first saw this beautiful Michael Kors Darci watch on Instagram. A fashion and beauty blogger who I follow @ohmygeeee.had uploaded several pictures of it, and I knew at once I had to have it too! I had long-since worn a thick black plastic Marc by Marc Jacobs timepiece which, whilst admittedly a statement item, could not be described as beautiful or feminine. Time for a change. First and foremost, I love the colour of this Darci watch. I would never, ordinarily, have considered rose gold - and I dont know anyone else who wears it - but the abovementioned IG pictures opened my eyes to it. The bracelet, strap and hands are created in a subtle pinky hue which is highly flattering to my skin tone. I bought this watch for everyday use and the delicate shade enables it to be used for this purpose given that the face is relatively large and its edges encrusted with eye-popping Swarovski crystals, I feel that any other colour yellow gold, silver, or indeed the deep purple version might have rendered this watch OTT for everyday and work-wear. With that said, the beauty and uniqueness of the watch does attract many a compliment - it remains a statement piece! I will add that before the watch arrived, I was slightly concerned that the rose gold would clash with my yellow gold wedding and engagement rings, and went as far as to search online for comments about mixing the two metals, but, once on, I dont feel that the two are an unhappy combination at all. The watch feels satisfyingly heavy on the wrist and when I went to have some links removed from the bracelet which, incidentally, is an easy process given the type the member of staff was very impressed by its quality. The light dances across the face and the long hands are elegant. The watch is presented on a cushion inside a sleek dark brown Michael Kors box, lined in faux suede. I struggle to find any negative points here, but for the sake of some balance, I will mention the fact that the clasp is every so slightly cumbersome now that I have shortened the bracelet. I needed to have five links removed as I have a very small wrist, and now, in order to close the watch, I must press one side into my my skin. This represents, however, two seconds of my day - the pleasure that I get from wearing the watch supremely outweights this minor niggle, and the removal of fewer links will probably negate it anyway. You will not be disappointed if you purchase this watch! Watch was for daughters 18th & she loves it. Beautiful colour & slimline! An investment! 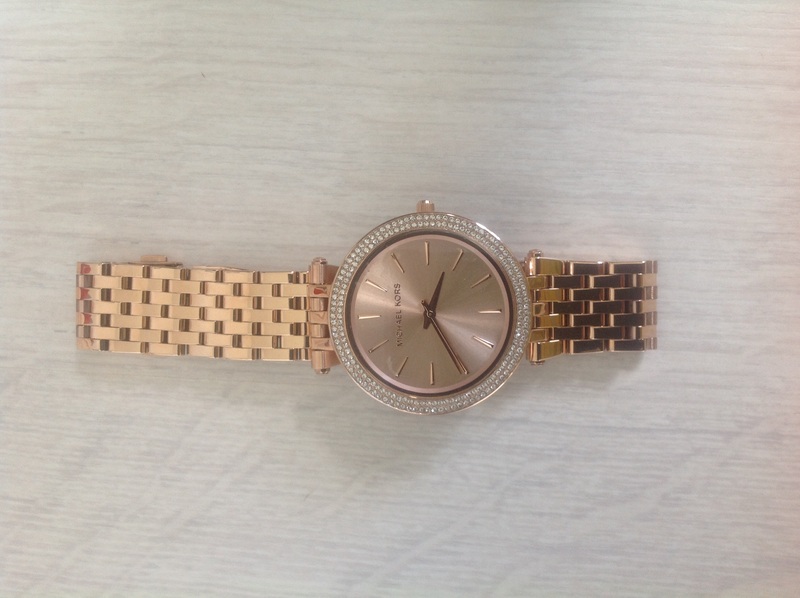 This is a very smart and beautiful watch which can be worn by any age.Im so, so pleased with the look and the price.Its a gorgeous rose gold tone.My daughter loves it and I do too. Bought as a present for my daughter. Beautiful watch, nice packaging. Delivery was quick. All in all very pleased with my purchase. Lovely looking watch and £60 cheaper than John Lewis too - perfect. Very impressed with the Michael Kors brand. Fab and very efficient service, great price and really good all round process, thank you, would def use again! Lovely item to buy I bought it as a first for my girlfriend and its just what she wanted not to small but a nice thin face on the watch. Great watch, nice big face as I have problems seeing smaller ones. Very stylish looks great. Great value for money. It took me nearly 4 weeks to decide on this particular watch and I am not disappointed. 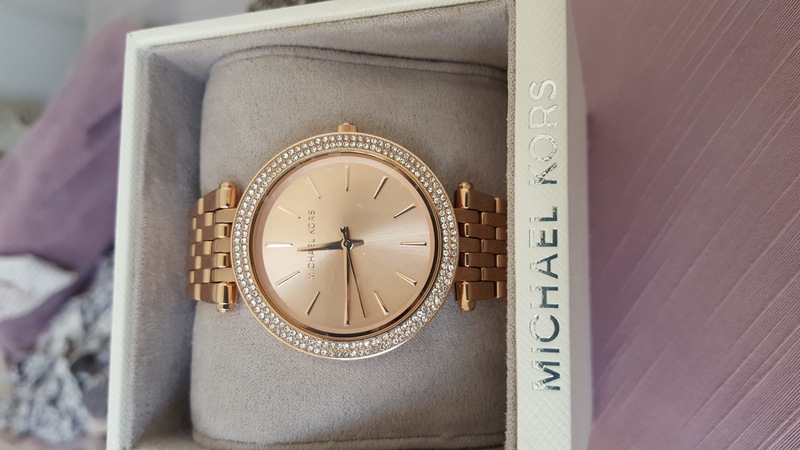 Bought this for my daughter for christmas after she is always going on about owning a Michael Kors watch.The watch itself is beautiful in Rose gold. It has a large face but is not too chunky making it still really classy and feminine. Would reccommend this watch in a flash without hesitation. Cant wait to see my daughters face Christmas morning ! Very stylish watch. Love the rose gold. A great gift for my sisters 30th birthday. Very quick delivery. Very stylish and elegant watch I absolutely love it, wear it all the time very light and comfy. 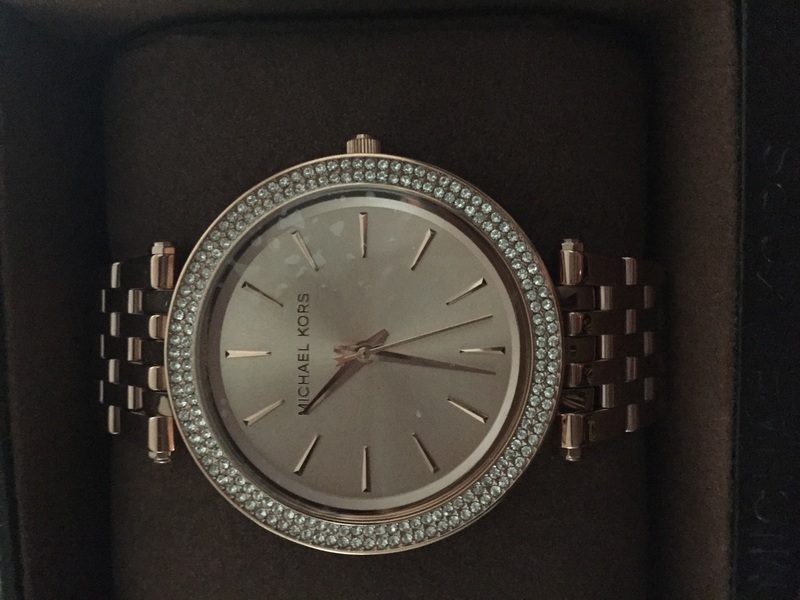 Brought a Micheal kors watch for a Christmas present for my daughter who is 24 years old. Took some time to decide whether to buy as it wasnt cheap, but when I saw it i was so glad I did. What a stunner ! Rose coloured, large faced with 2 sets of sparkles going all around the watch outer face twice, thin and felt comfortable on the wrist, well I had to try it on ! Very elegant and stylish watch. I just no shes going to love this with. This watch is very very simple but absolutely beautiful, it is not over the top at all & is very eye catching! !